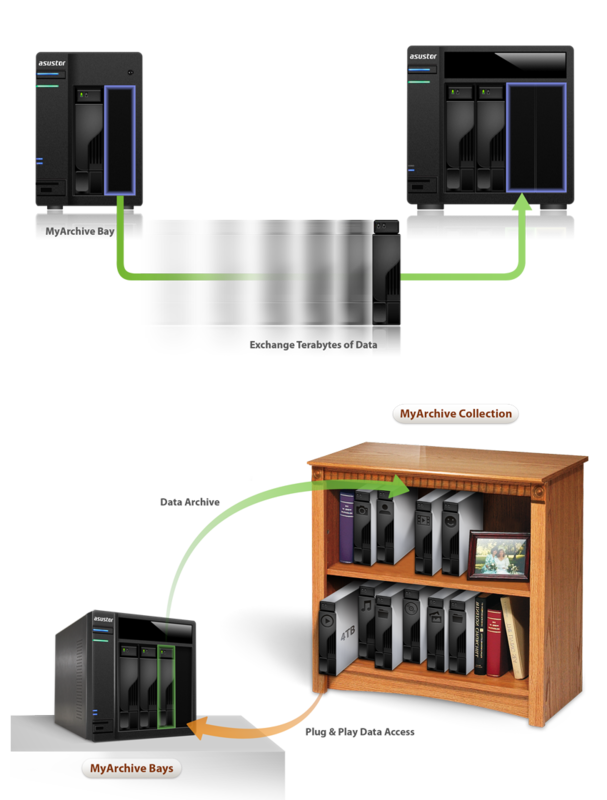 The MyArchive function allows you to use hard disks as removable storage archives. Plug in an archive when you need it and swap it out for a different archive when you don't. 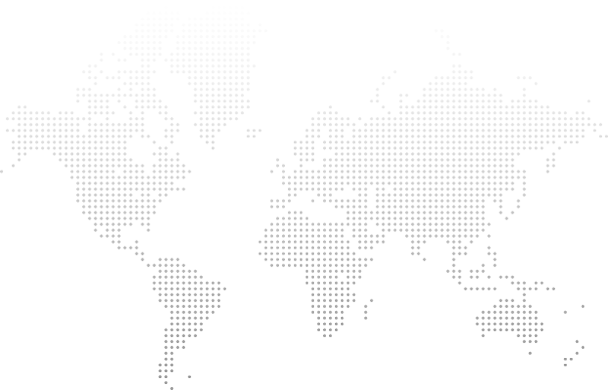 Enjoy 'plug and play' convenience as you swap between different data collections. Furthermore, the MyArchive function helps you to save power as the archives you are not using can be taken out for storage and do not always have to be powered on. Note: This function may differ depending on the NAS model in use. Now, you no longer have to endure slow file transfers over the internet when sharing your multimedia collection with your friends. Have your friend directly plug in one of your MyArchive hard disks to get instant access to terabytes of data. The number of simultaneous configurable MyArchive hard disks has been significantly increased to N-1. This means that for 4-bay models (e.g., AS6104T) you can have 3 simultaneously mounted MyArchive disks and for 10-bay models (e.g., AS7010T) you can have up to 9 simultaneously mounted MyArchive disks. When you access the data in a MyArchive disk, the other MyArchive disks can remain in hibernation, helping you save power. When used with local backup function, you will be able to take different types of files with different properties and neatly organize and back them up to individual MyArchive disks, all in one go. Furthermore, a newly added “Alias” field lets users self-define tags for MyArchive disks. This allows users to quickly determine the contents of MyArchive disks from within ADM File Explorer when multiple disks are mounted simultaneously. 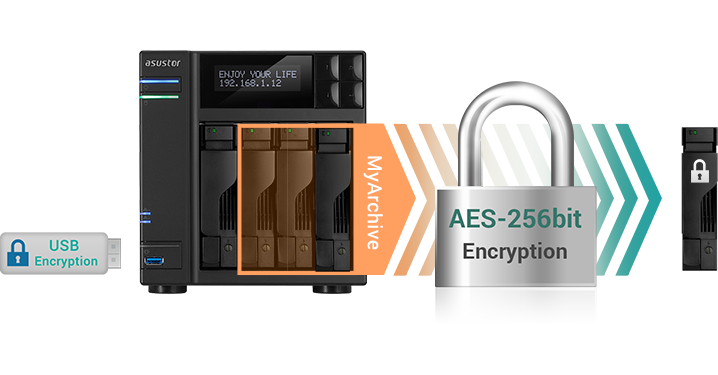 MyArchive hard disks now feature newly supported AES 256bit encryption* and can be configured to automatically mount on up to 20 trusted NAS devices for more agile use. Decryption method, In addition to entering a password or importing an electronic encryption key for decryption you can also now bind a USB device as a physical encryption key**, allowing you to securely hold your data security in the palm of your hand.